Want a cross between peanut butter cookies and homemade bread? 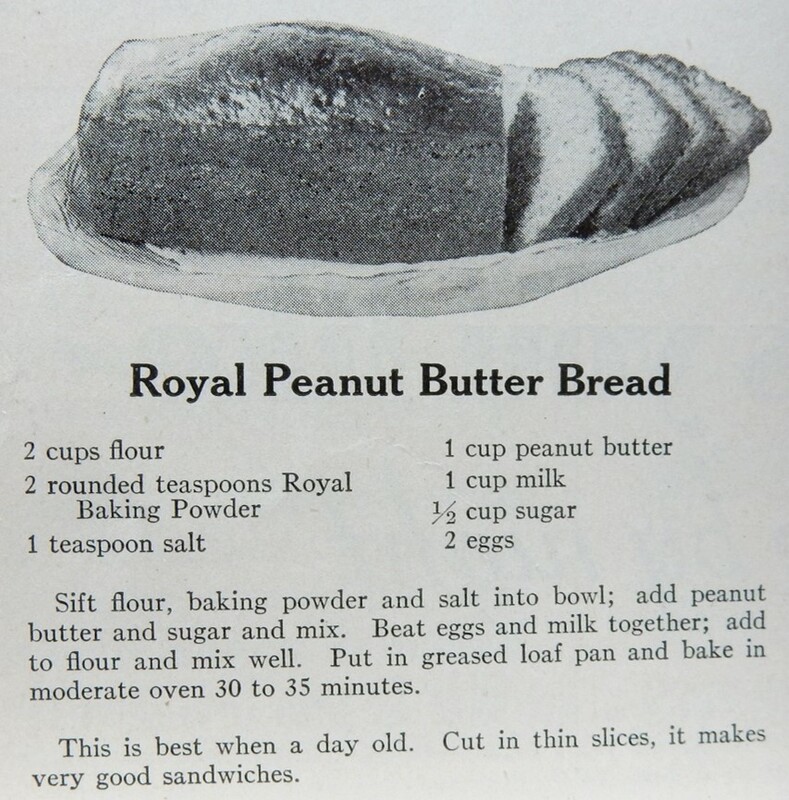 If so, a hundred-year-old recipe for Peanut Butter Bread may be just the recipe for you. Preheat oven to 350° F. Grease and flour a loaf pan. In a mixing bowl, stir together flour, sugar, baking powder, and salt. Add peanut butter, milk, and eggs. ; beat until well mixed. Bake 35 to 40 minutes or until a wooden pick inserted into center comes out clean. May be served warm or cold. The hundred-year-old recipe called for 2 “rounded” teaspoons baking powder. I used 2 1/2 teaspoons of baking powder – and that worked well. I used less salt than called in the original recipe. One teaspoon of salt seemed like a lot for a loaf of bread, so I reduced it to 1/2 teaspoon. The old recipe says that this bread is best when it is a day old. In my opinion, the bread was good the day after I made it – though it also was good shortly after I took it out of the oven. Ever wonder what to do with a food once it’s past its prime? A hundred years ago that was often a problem. For example, the homemade bread would often go stale before it was all eaten, and the non-pasteurized milk that most people drank often soured. The solution was to make a dish that was even tastier than the original foods. The century-old recipe that I found for Sour Milk French Toast calls for – well, you guessed it – sour milk and stale bread. I had neither sour milk nor stale bread, but decided to give the recipe a try. I used vinegar to “sour” the milk. (Lemon juice would also work.). And, I used day-old homemade bread (though commercially made bread would also work well). 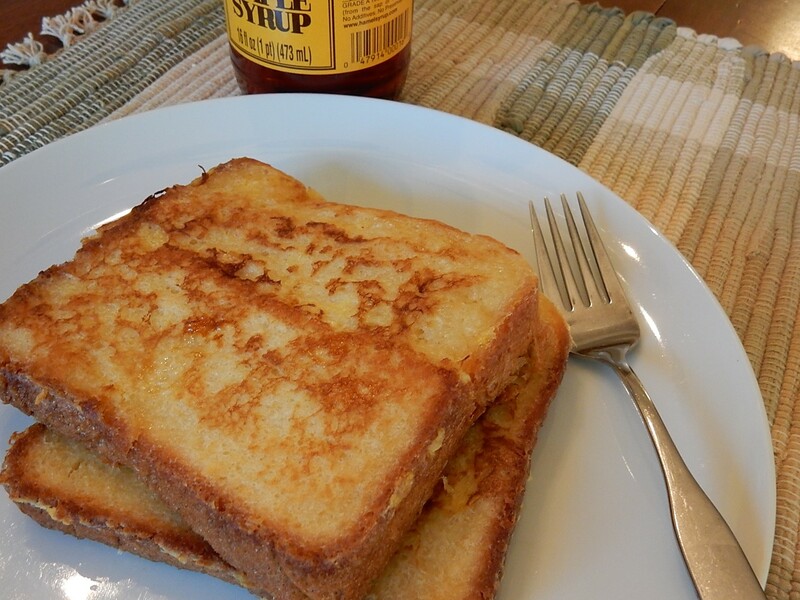 This recipe made a tasty French toast that I’ll definitely make again. Stir together milk, vinegar, egg, salt, baking soda, sugar, and flour to create a thin batter. Dip each slice of bread in the batter. In the meantime, heavily grease griddle or skillet with a mixture of butter, and shortening, or lard. (The old recipe suggests that a mixture of butter and lard might add a nice flavor.) Heat griddle or skillet, and put prepared slices of bread on it. Brown bottom side; flip and brown on other side. Remove from heat and serve immediately. Have you ever “hidden” vegetables in food to get your kids to eat healthier? 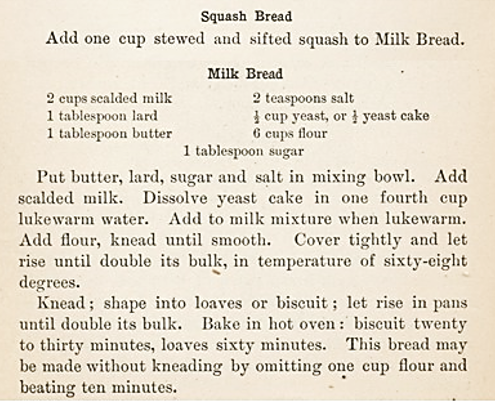 I thought that hiding vegetables was a recent trend, but when I made a hundred-year-old recipe for Squash Bread, I discovered that cooks have been hiding vegetables for a long time. The Squash Bread had a rustic artesian look, a nice texture, and a sunny yellow tinge – but I couldn’t taste the squash in it. It just tasted like the typical homemade bread. The verdict: If you want to hide vegetables in bread this recipe is worth a try; otherwise, just stick with your usual bread recipe. Scald milk by heating in a sauce pan until the milk begins to steam and form bubbles; use medium heat and stir occasionally. Remove from heat before it comes to a boil. Let the scalded milk cool until it is lukewarm, then dissolve the yeast in the milk. Put 2 cups flour, squash, shortening, butter, sugar, salt, and the water and yeast mixture in a large mixing bowl. Beat until smooth. Add enough additional flour to make a soft dough. Turn out onto a lightly floured surface and knead until smooth and elastic (about 10 minutes). Place in a greased bowl. Cover; let rise at room temperature until doubled in size (about 1 hour). Turn onto lightly floured surface and knead for an additional 5 minutes. Divide dough into two equal parts and shape into loaves. Place in 2 greased loaf pans, 9″ X 5″ X 3″, and cover. Let rise until doubled in size (about 30 minutes). Bake loaves in 400° F. oven for 35 minutes or until lightly browned. 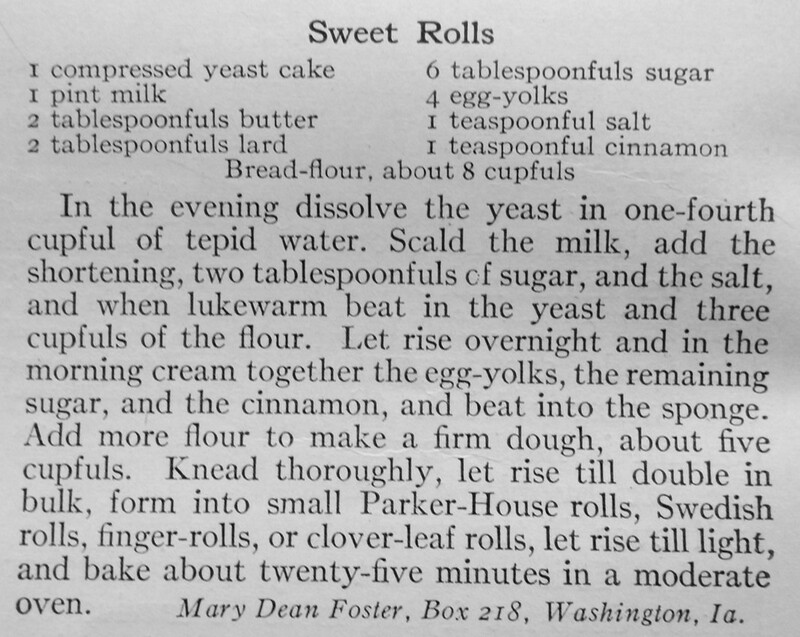 I always find old-time bread recipes particularly difficult to interpret because modern yeast is so different from what it was a hundred years ago. Back then it was not dried like the yeast that we generally use today. I guessed that 2 packages of dried yeast would be the equivalent of 1/2 cup (1/2 yeast cake) back then. This substitution worked just fine when I made this recipe. 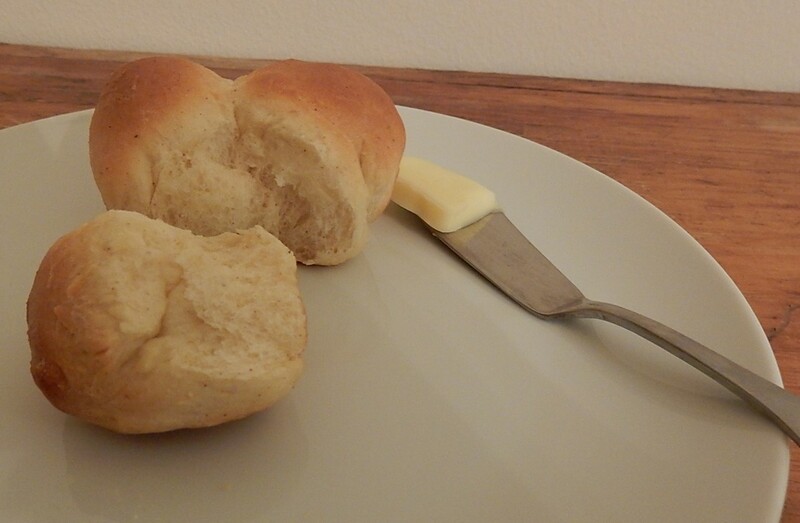 There’s nothing like fresh-baked rolls to make a meal really special. When I saw a picture of Clover-leaf Rolls in a hundred-year-old issue of Good Housekeeping, I knew that I had to try making them. 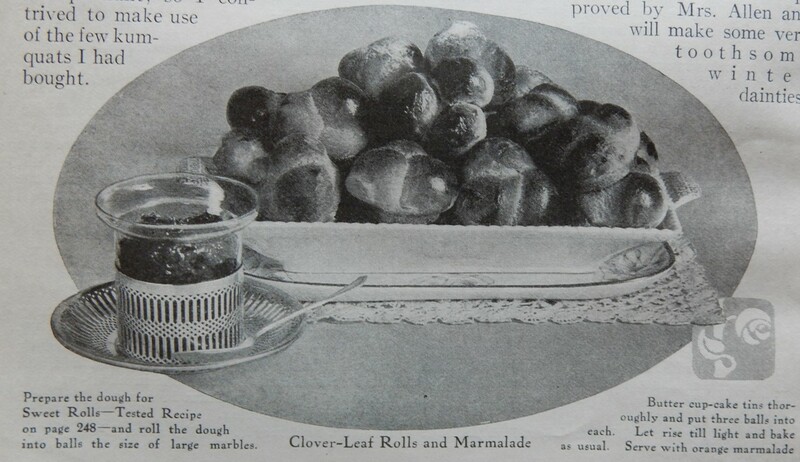 The picture in the old magazine brought back warm fuzzy memories of making Clover-leaf Rolls with my mother when I was a child. I remembered how much fun it was to roll small balls of bread dough between my fingers and put them into muffin tins — 3 balls in each cup. And, I could remember how much fun they were to eat after they were baked. Clover-leaf Rolls pull apart beautifully and are delectable with a little butter or marmalade. The recipe did not disappoint. 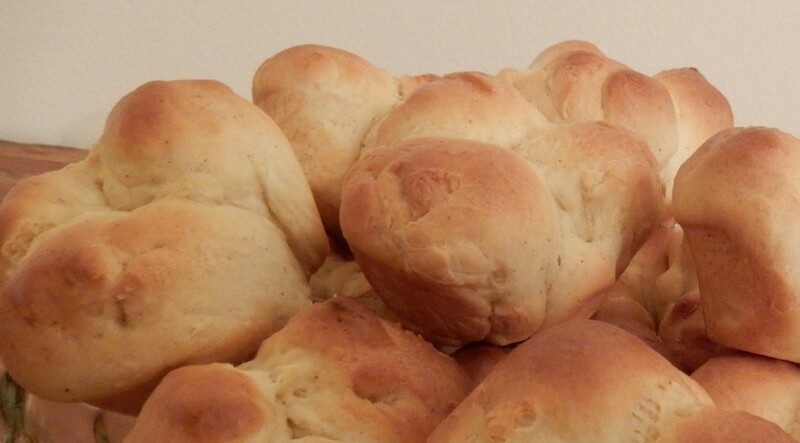 The rolls were easy to make and my kitchen was filled with the lovely aroma of baking bread. And, when I took the rolls out of they oven, they were light and heavenly with a hint of cinnamon. The original recipe was for Sweet Rolls, and said that it could be formed into a variety of shapes, including Clover-leaf. It called for a compressed yeast cake and 8 cups of flour. I knew I didn’t need that many rolls, so I made 2/3’s of the recipe, and substituted instant yeast for the compressed yeast. Put milk in saucepan and scald; then cool until lukewarm (110 – 115° F.). Dissolve the yeast in the milk. Then in a large bowl combine the dissolved yeast mixture, butter, shortening, sugar, egg yolks, salt, cinnamon, and 3 cups flour. Add additional flour until the dough is easy to handle. Knead the dough on a floured surface until it is smooth and elastic (about 8 minutes). Place in a greased bowl, cover and put in a warm spot. Let rise until doubled in size (about 1 1/2 hours). Grease muffin pans. 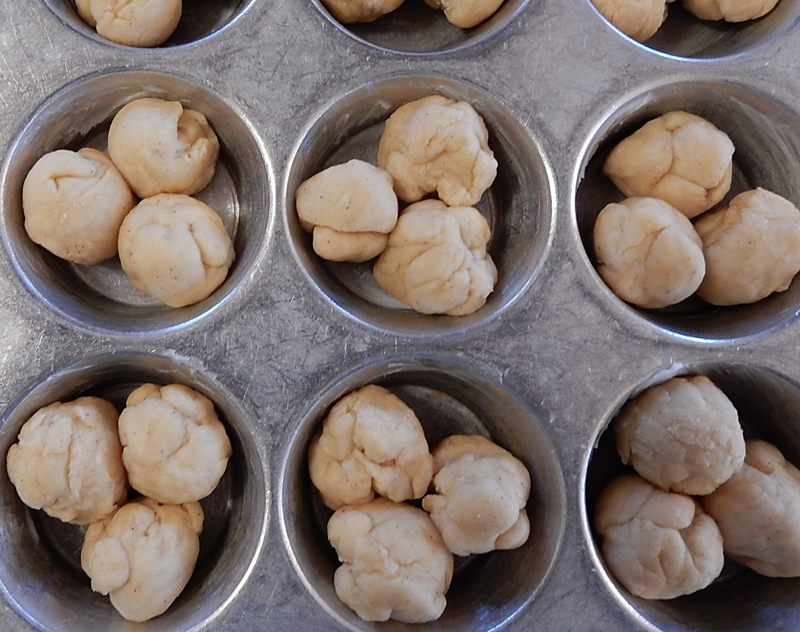 Punch down dough, then pinch off pieces of dough and shape into 1-inch balls. Placed 3 balls in each muffin cup, and brush with butter. Let rise until double (about 30 minutes), then place in preheated 375 ° F oven. Bake 20-25 minutes or until lightly browned. My curiosity got the best of me–What was it? . . . a cake? . . . a bread? . . . a pudding? 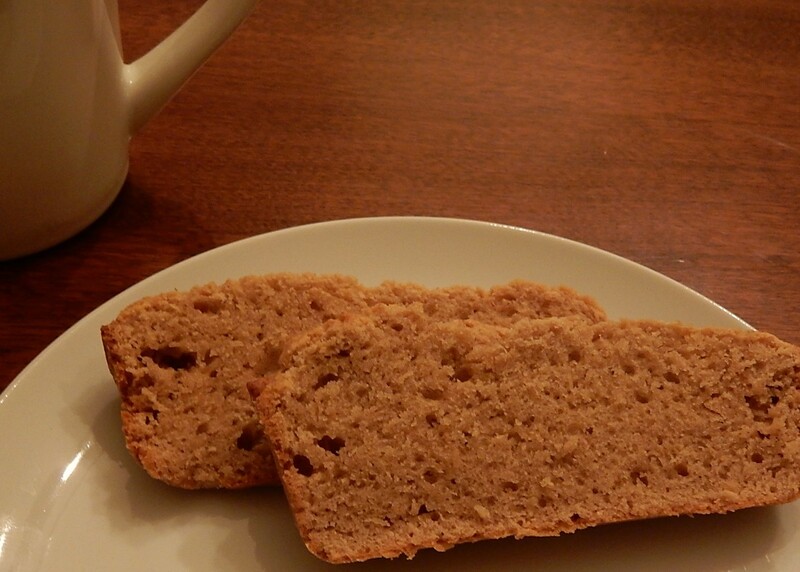 But after it cooled, it seemed more like a coffee cake–a very nice coffee cake. I didn’t try it with hard sauce so I’m not sure whether it also seems similar to steamed puddings–but I did post on old hard sauce recipe awhile back so maybe someone else will try that and let us know. Preheat oven to 375° F. In a small bowl combine sugar, cinnamon, and currants. Set aside. In a separate bowl, combine flour, baking powder, salt, butter, egg, and milk. Stir until a thick dough forms. 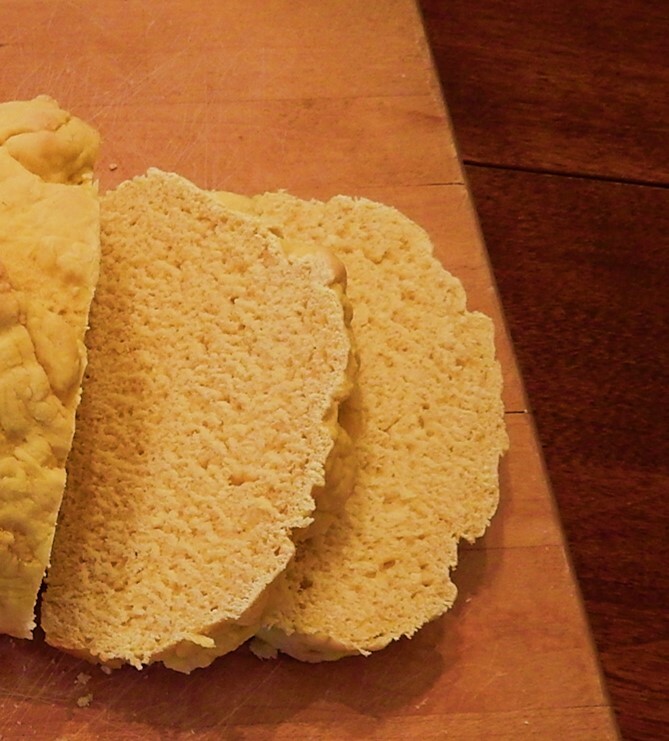 Put dough into a well-greased bread pan. Firmly press the narrow edges of the apple slices into the dough in parallel rows; then sprinkle with the sugar and currant mixture. 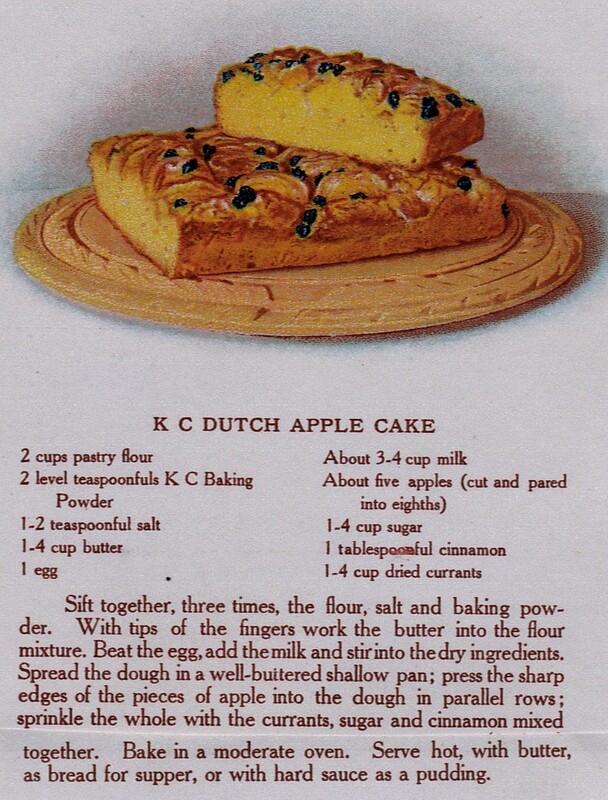 Place in oven and bake approximately 40-45 minutes–or until a wooden pick inserted into the cake (not the apples) comes out clean. Remove from oven. Use apples that hold their shape in this recipe. I used Braeburn apples. Monday, August 24 – Thursday, August 27, 1914: For lack of something to write. This is the third of four days that Grandma combined into one entry. 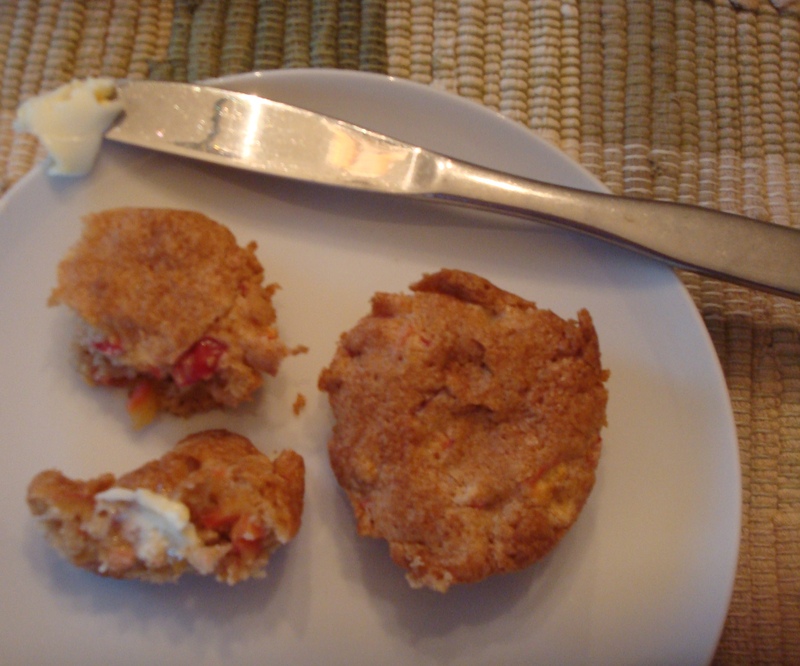 Since Grandma didn’t give me much to go on today, I’m going to share an old recipe for Crab Apple Muffins. A hundred years ago farm family meals in August were generally based on foods which were in season. I wonder whether Grandma’s family had a crab apple tree. Crab apples are ripe here. 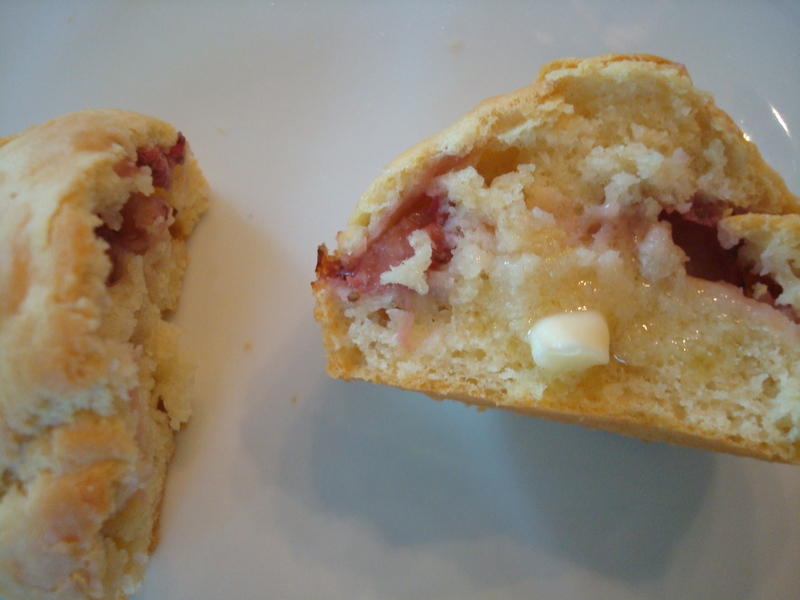 A crab apple recipe that I especially enjoy is Crab Apple Muffins. The chopped crab apples give the muffins a wonderful, flavorful, tart zest. Preheat oven to 350° F. Combine eggs, melted butter, vanilla, white sugar, and brown sugar in a bowl. Stir in baking powder, cinnamon, salt, and baking soda. Add flour, and stir until combined. Add the chopped crab apples. Grease muffin tins, and then fill each muffin cup approximately 2/3 full with batter. Bake for approximately 30 minutes or until lightly browned. *Core crab apples before chopping, but do not peel. Saturday, June 20, 1914: Am having quite a time working these days. Hardly take time to eat my dinner. Grandma sure has been keeping busy picking strawberries. I hope that she was well paid for her hard work. What did she have for her rushed dinner? . 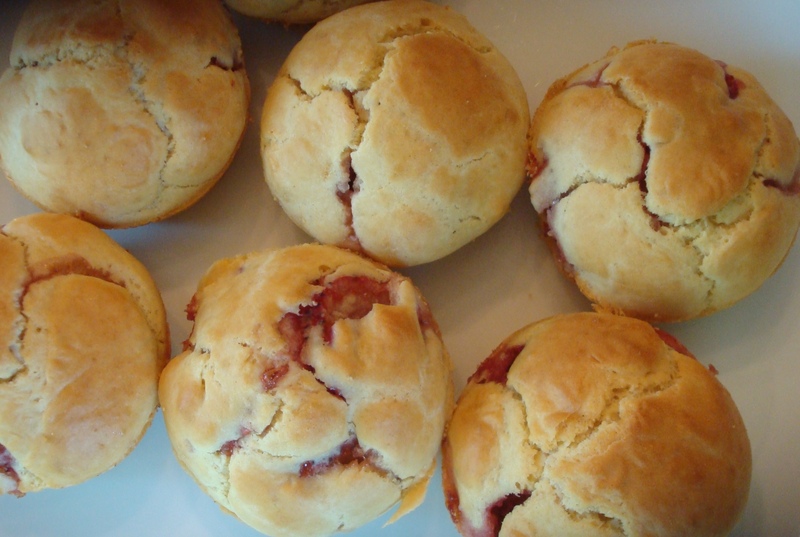 . . well, she probably was eating seasonal foods, so maybe one food was Strawberry Muffins. The June, 1914 issue of Good Housekeeping had a recipe for Strawberry Muffins–though back then they were called “Strawberry Cups”. Here it is—slightly adapted for modern cooking methods and ovens. Preheat oven to 400° F. Separate two eggs; beat the yolks and add one cup of milk, one-half teaspoon of salt, and a tablespoon of melted butter. Add two teaspoons of baking powder and one and a half cups of flour, and beat well. In a separate bowl whip the egg whites until stiff, then fold the whites into the batter. 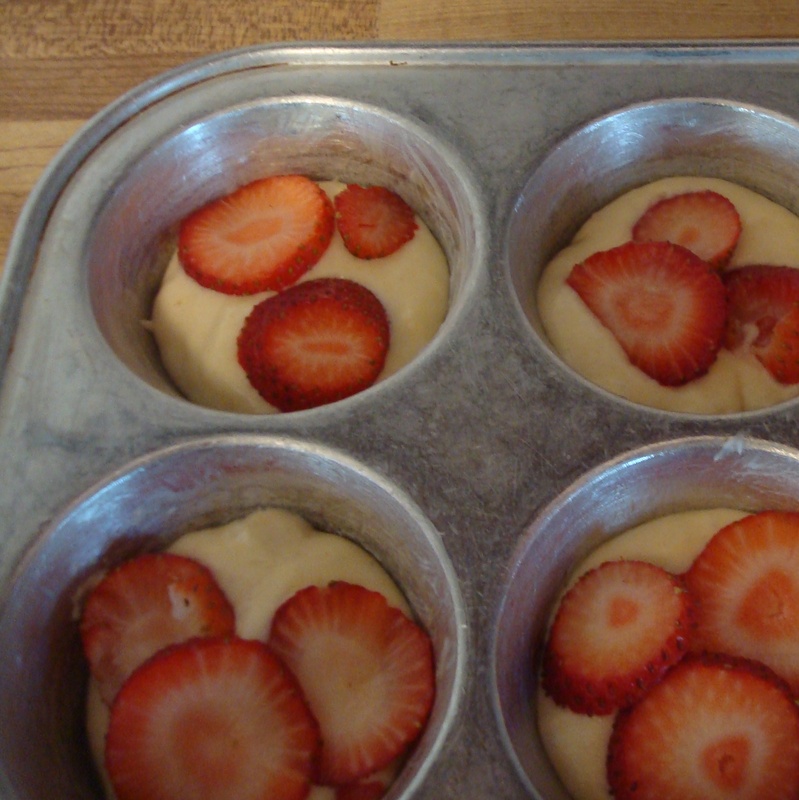 Put a tablespoon of the batter in each of 12 muffin pan cups. Add a layer of thinly sliced strawberries; then fill the cups two-thirds full of batter, and bake for 20-25 minutes or until lightly browned. Best when served warm.